Gran Misión Vivienda Venezuela: The Chavernment mission that keeps on giving buildings… and problems. 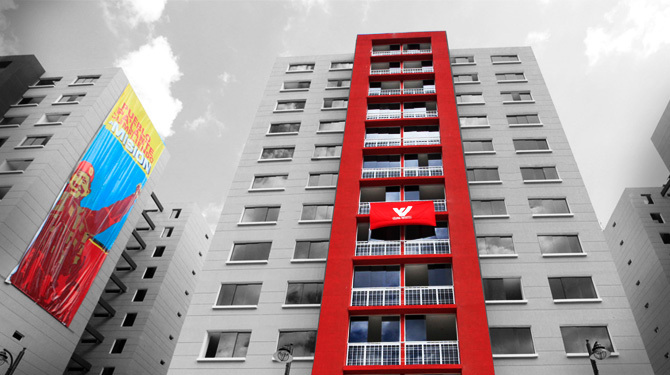 Last month, after two years of waiting in shelters, 96 displaced families were given the keys of their brand new apartments in a new tower built in Western Caracas, as part of the Gran Misión Vivienda Venezuela program. Well… the 16-story building has no elevator, the electrical system is faulty, the trash ducts were yet not installed and several apartments have water leaks. Still, the owners are thankful to the comandante presidente and feel fortunate… as other displaced are still waiting for their homes. Some of them keep protesting while others are simply resigned to a grim life in the improvised shelters. The G.M.V.V. has set a big goal of delivering 380.000 houses for 2013 and State media covers the giveaway of new homes every Thursday, known as Jueves de Vivienda. But once the flashy coverage is over, the problems appear: finished constructions with questionable quality, delays and irregularities with workers and enviromental violations. Another issue that has surged is that neighbors in the new GMVV housing complexes sometimes don’t get along, and conflicts ensue. Sometimes, they end with violence. However, the Chavernment is so proud of the G.M.V.V. that they admitted it’s an electoral ploy, as the head of the Capital District Jacqueline Faria said in an assembly with residents of inaugurated buildings in the Caracas sector of El Paraíso. Previous articleThe morgue conundrum, cont.